Why Do So Many Preachers In America Refuse To Talk About Hell? When was the last time you heard a sermon about hell? Just think about that for a moment. Once upon a time in America, preachers all across the land regularly unleashed fiery sermons that directly confronted people with the reality of heaven and hell. But today, that has completely changed. In fact, there are some very well-known ministers in this country that purposely avoid ever using the word “hell” because it might offend someone. It turns out that “happy church” can be a very lucrative business model, and many people seem to love the “me first” prosperity gospel that has infected virtually all of the major denominations at this point. So there are countless messages about “blessing”, “breakthrough” and how God can make your life better, and very, very little preaching about sin, judgment, the cross and the urgency that we should feel to reach lost souls with the gospel of Jesus Christ. 3 For the time will come when people will not endure sound doctrine, but they will gather to themselves teachers in accordance with their own desires, having itching ears, 4 and they will turn their ears away from the truth and turn to myths. Is this not precisely what is happening in the western world today? We have put the gospel on the back burner, and we have exalted preachers that endlessly fill our ears with messages that make us feel better. Meanwhile, Americans are starting to turn away from the church altogether in alarming numbers. The research found the reasons included a decline in the number of Americans who believe the Bible is sacred literature from 86% in 2011 to 80% in 2016. Plus there’s a drop in the number of people who say the Bible is sufficient as a guide for meaningful living from 77% in 2011 to 67% in 2016. In 2015, CBN’s Paul Strand reported how faith is losing its foothold in America. Millennials in particular are driving these declines as the age group with the most respondents saying there were no books they considered sacred. Sixty-two percent said they have never read the Bible. Millennials – especially the youngest Millennials, who have entered adulthood since the first Landscape Study was conducted – are far less religious than their elders. For example, only 27% of Millennials say they attend religious services on a weekly basis, compared with 51% of adults in the Silent generation. Four-in-ten of the youngest Millennials say they pray every day, compared with six-in-ten Baby Boomers and two-thirds of members of the Silent generation. Only about half of Millennials say they believe in God with absolute certainty, compared with seven-in-ten Americans in the Silent and Baby Boom cohorts. And only about four-in-ten Millennials say religion is very important in their lives, compared with more than half in the older generational cohorts. We are steadily becoming less religious as a nation. 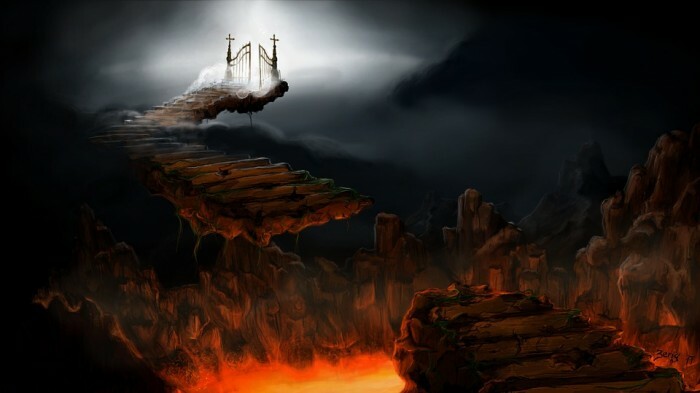 But even though that is the case, another Pew survey did find that 72 percent of Americans still believe in heaven and 58 percent of Americans still believe in hell. So even though our society is moving away from God at a frightening pace, most people still acknowledge the reality of heaven and hell. Most people still understand that God is going to hold them accountable for their actions, and that they are going to go somewhere when they die. So why are so many preachers afraid to talk about these things in our day? Where are the men like Charles Finney, D.L. Moody and Charles Spurgeon that won multitudes of souls for their Savior and literally changed the course of history with their fiery preaching? Sadly, most churches in the United States have already gone apostate. You may not want to hear this, but it is true. I see the rise of a super church, a supernatural invisible church, a union of deeply spiritual followers of Jesus Christ, bound together through the Holy Spirit and mutual confidence in Christ and in his word. This supernatural church of true believers will become a kind of underground church. It will include Catholics and Protestants of all denominations, young and old, black and white, and people of all nations. While this visible super church gains political power this invisible body of believers will grow tremendously in spiritual power. This power will come from persecution. The persecution madness that is coming upon this earth will drive these Christians closer together and closer to Jesus Christ. They will be less concerned about denominational ties and more concerned and emphasis on the coming of Jesus Christ. The Holy Spirit will bring together as one people in all walks of life. My wife and I talked about this “Remnant” that is arising during one of our recent television shows and I also discuss it in my new book entitled “The Rapture Verdict“. God is raising up an army, and there is no church, denomination or individual that is in charge of it. Instead, it is an organic move of God that is happening largely outside of the institutional church. In fact, if the institutional church does not wake up, it is in danger of being completely left behind by what is happening. And I am completely convinced that we are going to see the greatest harvest of souls in the history of the church in these last days. God is raising up men and women of God that are going to preach passionately about the reality of sin, judgment, hell and the cross. They aren’t going to be afraid to offend people, because they are going to be consumed with a passion to help people find eternal life through Jesus Christ. I want you to imagine something for a moment. Imagine a line that stretches from one side of your computer screen to the other. That is your life. Whether it is 20 years long or 120 years long, it had a beginning and it is going to have an end. Now imagine that line continuing past the end of your computer screen and traveling out of your house and across the street. From there, imagine it traveling at a very high rate of speed from city to city, country to country, until it encircles our planet literally millions upon millions of times without ever stopping. If the Bible is correct, you have a choice to make. You can choose Jesus and spend forever with Him, or you can choose to reject Him and be forever separated from your Creator. Heaven and hell are both very real, and the Son of the Living God came to this planet and died an incredibly brutal death on a Roman cross so that eternal life could be offered to you as a free gift. If you want to have a relationship with Him, it is very easy. Just repent of your sins and invite Jesus Christ to come into your life. He will forgive every evil thing that you have ever done, and He will give you a life that is never going to have an ending. I pray that you will make that decision today. Next articleWhy Are Americans Getting Married An Average Of 7 Years Later Than They Did In The 1950s?